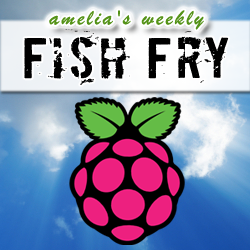 Fish Fry is going raspberry this week, Raspberry Pi that is! My special guest is none other than the co-creator of the Raspberry Pi board Gert van Loo. Gert and I are chatting about how the Raspberry Pi board was created, how Gert built upon Raspberry Pi to create the Gertboard, and why he thinks IO education is important for the next wave of engineers. Also this week, I’m chatting with Cliff Ortmeyer (newark element14) about the interesting intersection of hackers, makers, and engineers. In keeping with this week’s theme, I have a Raspberry Pi Model B to give away to one lucky listener– courtesy of newark element14.